Rats, rat, ratty, ratties, pet rat, fancy rats, lab rat, tamrattor, meaning tame rat, whatever you call them...they are as far removed from their wild cousins as a dog is from a wolf. I wish a better name had come to them the way the dog was given it's name. More people I believe would be more open to them as pets. I had no idea what great pets ratties are until I was in my 40s. Before that I was terrified of rats and mice. Why? I am not sure, I love animals and have always had many. Rodents and others. I literally had to desensitize myself to pet rats and pet mice....now I have had and bred both species. Plus I have trained, played with, and enjoyed many ratties and mice by now. 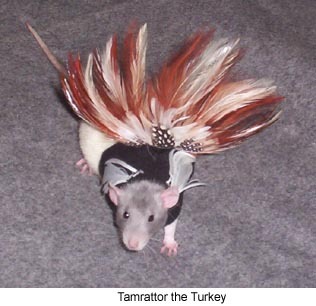 I have and do design clothes, costumes, outfits, toys, and other rattie related items for our rats. Here's a little of what I have learned about ratties. Ratties are very clean animals. Pet Rats clean themselves much like a cat cleans itself. You may notice that after you have been playing with your rat and put it back in it's cage it starts grooming itself to remove what you have "gotten on it". You can give a rattie a bath too. Does their pee stink? Do bucks have more of an aroma then does? Do bucks mark with urine? Well? Shall we talk also about human urine smell? Shall we talk about how most men "miss" the toilet bowl? Do men smell more then woman? So if you pull this into perspective....rats are really not bad at all. They just have nothing to flush, so their bedding needs to be cleaned regularly or yes, it will smell. You can give a rattie a bath in warm water. Use a mild shampoo and very little of it. Be sure to dry your rattie before placing it back in the cage that you have cleaned before or just after the rattie's bath. When drying your rattie, if you use a blow drier be careful not to hold it too close the the fancy rats body and do not hold the drier still, move it around so that one spot does not get too hot. Be gentle with cleaning rattie tails. They have little scale like rings on their tails. Do not clean them backwards. You can also use baby wipes to clean or even spot clean your ratties. Again, do not wash the tail backwards, away from their bodies only. Rats, although they do squeak from time to time, are very quiet animals. Rats are one of the most quiet animals you could own. Dogs bark, Guinea Pigs squeak and squeal, rats are quiet as a mouse. Fancy or Pet rats not only can learn their names, they will come when called if taught to. Pet rats can also learn to do tricks and tasks. The more time you spend teaching or training your rattie, the more it will learn. Best!! The more time you spend with your rattie the more time you will want to spent together. Because pet or fancy rats are so smart they like to play with toys. Some say that a rattie that has toys to stimulate them is smarter or shows more intelligence then one that does not have toys to play with. Give your pet rat or fancy rat safe toys. You can make these yourself, or buy toys made for ratties or parrots. Rats really like parrot ladders and ropes to climb on and play with. Visit our Rats Learning Tricks page, our Training Your Rat(s) page as well as have a look around this entire site. Your rattie will thank you for it. Rats can and do recognize their owners, they like to be near their owners and will seek them out. Ratties, like a dog or cat or other pets, enjoy being petted, gently stroked behind the ears and a gentle rub on the belly. Some ratties will also "groom" their owners. They might clean your finger or your hair. Don't be surprised if they also want to clean your mouth. Rats are a good pet for anyone. A pet or tame rat rarely bites. Most of the time a rat that does bite is looking for food in your hand. Maybe you tend to hand feed it and it is looking for something, or your hand smells like the food you just ate and the rattie just wants some of what you had. Note: Just as you would not reach in to break up a dog fight Do Not reach in to break up a rat fight. You could possibly get bitten. You can throw a towel over them or spray them with water, but do not reach in. Also: Do not pick up one of the fighters right after the fight has stopped, you may just get bit in the reaction. The rattie is not out to bite you. But like a dog, it just gets in a frazzle over the interspecies fight. If you keep their toenails clipped and or filed, you will not likely receive scratches on your arms and neck....but it can happen. I spray my neck with cologne (alcohol) after I put my ratties away so that if I have any scratches, they will heal quickly. Pet Rats are fun. They like to spend time with you, will come to you, you can teach and train them, and yes, I even dress my ratties up in cute little clothing and costumes. Check out our photo section of this website, as well as our Rat Items For Sale page to see some of the outfits and costumes I design and make for them. As compared to other pets, a rat is an inexpensive pet. Rat food is so much cheaper, then say, a good grade dog food, and rats eat such a small amount. Keeping your ratties in a cage is so much cheaper then buying a dog crate and kennel, as well as collars, leashes, ect. Once you buy the cage you can keep ratties in for years to come. 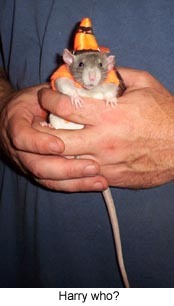 Ratties do not need to be neutered or spayed as a dog or cat will. They can be and if keeping a buck and a doe together it is highly recommended, rats breed fast and often. You do not need tags and licenses and inoculations for a fancy pet rat like those of dogs and cats. 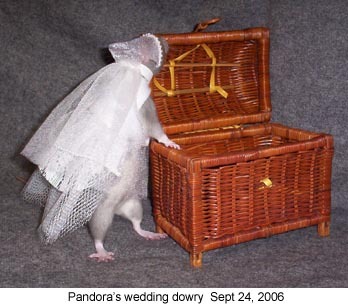 If you decide to participate in a sport, like Pet Rat Agility, it is much cheaper to buy, build and haul the equipment for a rattie then for a dog or cat or ferret....and storage? Need I say more. Once you have owned or even played with one at a friends or in a pet store; Remember my saying "Rats have a way of multiplying even if you do not breed." You never know when you will walk into a pet store and bring home a new pet with that food or toys or cage you went in for. Or if a friend will gift you with another rattie from a litter they bred, or you did breed and weren't going to keep any....yeah, try that!! You never know when a fancy rat will need a new home and a new friend, or however they come....they do come. Once a rat lover always a rat lover. Our websites are a work in progress so check back often.